“Reconnecting the economic engine to a strategy for human development is an urgent matter. A focus on children can make that reconnection. * if we have been beguiled into an unsatisfying consumer life, it is children who teach us what is important and what constitutes an agreeable and productive life”. Eight new children’s teams are to be established: Horowhenua, Marlborough, Hamilton City, Clendon/Manurewa/Papakura, Gisborne, Whakatane, Whanganui and Christchurch.. These children’s teams are likely to produce some positive results for those children included in this collaborative, holistic model. One small step for vulnerable children but let us not forget the remaining 200,000 or so children identified as vulnerable to poverty primarily because their parents have insufficient household income to afford basic human necessities (nutritious food and a warm, healthy stable home to name a few) but who wouldn’t necessarily meet the threshold of the children’s teams that would enable this group of vulnerable children to receive prioritised support. One big step for children living in poverty must be the logical next stage! Carole's Story. The latest Touchstone is out ! Check out Carole’s Story and David Hanna from Wesley Community Action’s piece on vulnerable children and whether a deficit label is the best starting point for positive change? * promotes the link between fiscal and budgetary process and child poverty legislation. Interesting read and only 2 pages long! A new study published in the New Zealand Medical Journal shows that young pregnant Māori women are proactive in taking steps to seek out antenatal care but this was met with “inadequate information and support for young pregnant women navigating the next steps in their maternity care journey”. This finding blows out of the water a long held view that Māori teens weren’t proactively seeking out antenatal care. It seems this is not so but rather this view reflects an ethnocentric system holding a mirror up to itself. This Is Home : But are Pasifika People Getting a Fair Go? Is The Health of Our Pearly Whites A New Measure of Inequality? * there has been an increase of nearly four-fold, from 0.76 per 1000 of population in 1990 to 3 per 1000 in 2009. * dental admissions were greatest for children under the age of eight, for Māori people, pacific people, people in the most deprived quintile of the NZDep 2006 index. * one-third of people aged 18-34 years who were admitted to hospital primarily for dental care were acute admissions. These official statistics speak for themselves: poor children, poor young people and poor adults have the poorest dental health and are more likely to access dental care through hospital admissions. Inequality of our pearly whites is real but it’s no joke! Check out The Nation with panelists Max Rashbrooke, Political Editor Patrick Gower, and commentator Matthew Hooton. Inequality is the focus. Watch out for Max’s considered responses to Matthew Hooton’s loud bombardment of outdated arguments on why inequality is not a problem for him and his mates. Climate change, inequality, an ageing population, child poverty, environmental degradation are just some of these bigger issues that New Zealand’s future generations will face head on while us oldies are either sunning it or not of this world. Alas, our predisposition towards measurements of GDP and let the market sort it attitude just won’t cut it as far as developing solutions go. But fear not the Element and the Centre for NZ Progress are on to it! Over the next few weeks they will be hosting conversations to explore “what real progress means to New Zealanders”. This seems a new space and one to keep an eye on. Professors Richard Wilkinson and Kate Pickett, joint authors of “The Spirit Level” were in New Zealand last week presenting at the Sir Douglas Robb Lectures at the University of Auckland. If you didn’t catch the lecture, watch this insightful interview on TV3 ‘s The Nation where W & P dismiss the myth that inequality leads to more innovation, explain why conversations about inequality is important if we want people to care enough to make change, and what economic democracy in the workplace might look like. 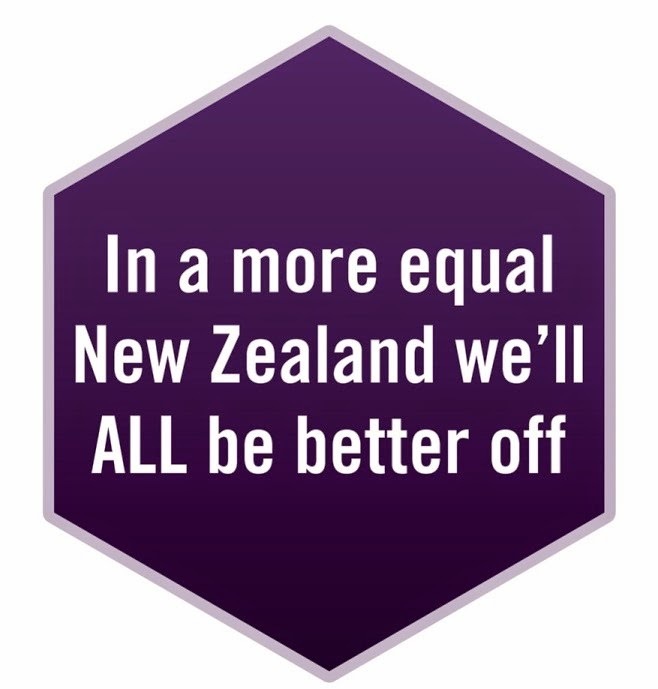 Award winning New Zealand documentary maker Bryan Bruce has a new website on inequality : Knowledge is Power. Check out the Closer Together Whakatata Mai Facebook page - new infographics on the the 30 Year story of inequality in NZ, the Growing Gap and Budget 2014 are there. Give us your feedback and join the debate. Housing New Zealand has acknowledged their initial community consultation was inadequate following three petitions lodged with Parliament’s Social Services Committee and have given assurance they have learnt from their mistakes. Tenants affected by housing developments in Maraenui (Napier), Pomare (Upper Hutt) and Glen Innes (Auckland) lodged the petitions over concerns about their treatment by HNZ and about projects “splitting up their communities and adversely affecting their health and well-being”. But in today's news Petone residents feel they have been "left in the dark" by HNZ. Warrant of Fitness Test Results - Good Start? More than 90 percent of rental properties in a nationwide survey have failed a "warrant of fitness" (WOF) check. That’s the bad news but the good news is the survey is part of a rental housing WOF trial involving councils, ACC, the New Zealand Green Building Council and the University of Otago. The aim of the trial is to test whether draft WOF checklists and methodologies were practical for landlords, assessors and tenants, which could potential improve the quality of private rentals. read the full report on the WoF trial on the Otago website. NZCCSS has received great feedback on its older peoples’ conference earlier this month. Thanks to all who came along and to the excellent keynote speakers and workshop presenters, who brought a great deal of expertise, experience and imagination to the conference programme. Conference presentations are online the NZCCSS Conference webpage and we will be adding them as they become available. The next issue of our Kete Kupu newsletter will include a conference report. Immigration NZ has produced what should be a very useful couple of guides for employers and migrants in aged care and home support. There has been input from many stakeholders in the sector to these guides and the aim is to help prepare migrants well for New Zealand aged care workplaces, which can be quite different from those in their own countries. The guides will also help the sectors’ employers understand the kind of challenges that migrants face when moving to New Zealand. Download the documents or order copies on the Immigration NZ website. Symposium on Women and Children: A ‘State of the nation’: A discussion on life for women and children in New Zealand in Auckland on Friday 4 July 2014. There is a great line up of speakers including a political panel with Hon David Cunnliffe, Hon Paula Bennett, Metiria Turei, Hon Peter Dunne and Tracey Martin represented. He Tai Pari, 14-15 July (Wellington). Don’t miss this 2 day conference on ‘Outcomes, Evidence and Collaboration in the Social Sector’. Sue Mackwell is one guest speaker, and the conference will update on learnings from the pilot sites and plans for the roll-out of the new Children’s Teams. More info is on the He Tai Pari website. SSPA - Political Panel : Leading up to 2014 Election: What are the policies of your local candidates that concern the social services Sector? Auckland 16 June, Wellington 17 June, Manawatu 13 August 2014. See details at Social Service Providers Aotearoa (SSPA) www.sspa.org.nz. The Practice of Seclusion in New Zealand : Submission to the UN Working Group on Arbitrary Detention: While we await news on the final report from the UN Working Group due to be presented to the Human Rights Council in 2015, here is the End Seclusion Now submission which raises strong concern about the current practice of seclusion in mental health services and calls for it to end. SPARX is an online e-therapy tool to help young people learn skills to deal with feeling down, depressed or stressed. The effectiveness of SPARX has been proven to be as good as standard care in Randomised Control Trial undertaken by the University of Auckland. Read more on the MoH website. Election 2014 Series: Our Children, Our Choice: Priorities for Policy Election 2014. The Child Poverty Action Group (CPAG) has released the first of a series of public discussion papers running up to the 2014 Election. The first in this series is Child Poverty and Health.